The Lantern Parade are Southampton’s most modest and under-rated band. Purveyors of Soulful balladry and vaudeville country death songs, says Ged Babey. 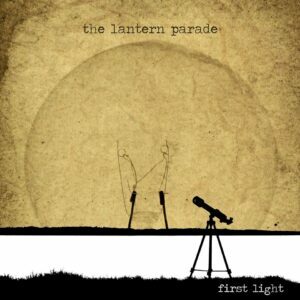 The Lantern Parade started unleashing their music on the public in December 2017 and the First Light EP marks the end of phase 1, with the departure of Dannie Holt -co-vocalist. You won’t have heard the last of her no doubt as she has a great soul-jazz voice. The first band you think of with shared male and female co-vocalists is the Beautiful South and the Lantern Parade aren’t a million miles away from them, but have a bit more verve and cover more bases musically. The songs I imagine are built on James Inflames piano/keyboards, which can go from classical to Abba style to jazz… yet never dominating the song, just giving it a foundation. A strong and versatile rhythm section support and a guitarist whose virtuosity is given free reign on the extended outro to Greater Love. Aaron Davis’ languid solo-ing on Sinners From Saints recalls my guitar hero John Perry (from the Only Ones) instead of his Clapton-ish playing elsewhere. My favourite of the four songs is the Man That Murdered Love – a Nick Cave type Country Death Song with accordion given an upbeat, vaudeville feel Marc Almond style. Paul Kenward is on fine, finger-clicking form vocally. The Lantern Parade have a big soulful sound on this EP with three of the four songs being slow-burning ballads which range from sounding like John Cale (Music For a New Society era) backing Corrine Bailey-Rae to, err… Take That circa 2006/7 ( Patience and Rule The World are actually great songs if you can disregard the fact they were written by a tory boy tax-evading egotist). First Light is an ambitious and beautifully produced work by a talented collective of musicians. Rather than capture the vibe of their live set, this EP seems to expand on it and showcase their top quality songwriting. A class act who just cannot be easily categorised.